Newegg is offering the ASUS MeMO Pad 7-inch for $89.99 with free shipping. It’s one of the lowest prices we’ve ever seen for a Google-endorsed Jelly Bean tablet. 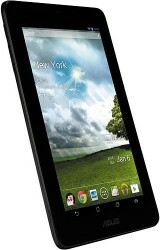 The MeMO Pad is, essentially, an entry-level offering ASUS has slotted below the Nexus 7. It uses a VIA WM8950 processor instead of NVIDIA’s Tegra 3, and matches the current entry-level Nexus tablet with 16GB of flash memory storage. It also features a 720P HD front-facing 2.0 megapixel camera, and a microSD slot. The MeMO Pad lacks Bluetooth. The tablet is a good entry-level option for those seeking Jelly Bean and Google Now, but without an interest in heavy gaming or multimedia. Still, with a Mail-400 GPU inside that VIA processor, it should be capable of decoding HD video and playing Netflix with ease. It’s not clear if this drastic markdown is a sale by Newegg, or ASUS engaging in aggressive price-cutting. The MeMO Pad 7 launched at a MSRP of $149.99 months ago, competing head on with the HP Slate 7 and other budget tablets in this price range.